Aksel is on full alert watching 3 caribou flying by. This is THE land of caribou - Tuktuk! Since we left Baker Lake four days ago, we have probably seen more than 300 caribou. They simply pop out of every corner. Most of the time they are in small groups of 5 to 10, but we have also seen 4 or 5 huge groups of 40 or more. Yesterday, extremely high winds from the south created whiteout conditions that hid them until they were RIGHT in front of us! Paul was standing in the middle of his team at the base of a steep little hill scouting a route when, out of nowhere, a large group of caribou galopped straight down into his team. It was hard to tell who freaked out the most, Paul and his team or the caribou. It all happened so fast. Paul and his team in full blast chase of the caribou. Today, caribou were grouped on our right and left, back and front, at times running fifty feet in front of the dogs back and forth! It is an incredible experience having the team trot along in front of you while surrounded by these graceful animals. Usually, the dogs get really excited if they just smell caribou. 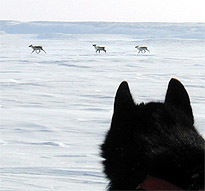 Now, the dogs barely pick up the pace until the caribou are in their face! Regardless, the dogs are, without any doubt, having a ball. Its almost as if they are on the hunt. The past few days travel has given us a deep appreciation of how and why the people of Baker Lake are the Caribou Inuit. As we hope you know from our last report, we had a great time in Baker Lake making lots of new friends - especially kids. They were very helpful to us and were even out every night taking care of the dogs. Sable was, without any doubt, the favorite polar husky to most of the kids. Being very gentle and playfull with kids of all sizes makes her the Polar Husky star of the week. Besides entertaining the dogs and teaching us Inuktitut, the kids also helped feeding and cleaning up after the dogs. This last part was very important because we had the dogs "parked" on the ice of Baker Lake itself. Most people in town still get all of their drinking water from this fresh water lake since it clear, clean, great tasting water. (As long as they take good care of it.) Contamination and pollution of water is something the Inuit people are very aware of, since it poses a major problem for them. See the Arctic is kind of like a big freezer, collecting all the bad stuff from around the world!!! Sounds weird, eh - but here is how it works. The wind and water currents flow from the equator towards the poles. So, basicaly anything in the wind or water will end up in the Arcitic or Antarctic depending on if it originates north or south of the equator. The bad news is that the world's air and water currents basically function as a transportation vehicle for pollutants carrying stuff like PCB's, Mercury, and other toxins from as far away as the United States, Europe, and Asia. Transboundary pollution is a term used to describe pollution generated in a country like Denmark, U.S. or Japan and deposited in another place like the Arctic. Once it reaches the Arctic it gets "stuck.” With the extreme cold and long periods of darkness, the Arctic acts like a big freezer preserving the pollutants or you could say "not breaking them down" (imagine a ocean-sized refrigeator preserving toxic groceries). For example one toxin, organochloride, has a "shelf life" of eight months in the lower latitudes where the sunlight breaks it down, but in the Arctic it will exists for 40 years!!! As a result of these factors, the Arcitc is a host to a large variety of toxic and hazardous materials, even though the region is so remote with very few people, cars, power plants or smelters its air and ocean is host to a variety of toxic and hazardous materials. Sable " the Polar Husky Star of the Week" - still just a pup she runs in wheel with Khan (her brother) and Spank on Mille's team. She is a hard puller, always happy, and loves people but can be hard on other dogs; she actually gets mad at Spank if he doesn't keep up!! Sable could also be named the "Trash Queen" of her litter. Running around at home, she always makes sure everything is getting recycled! On Will Steger’s International Arctic Project (IAP) expedition in 1995, some pretty interesting experiments reflected this information. Here is one example: a number of schools decided to focus on studying this phenomena and eventually compared the level of pollution in different waterways. Several schools throughout the US - Texas, Minnesota, Missouri etc. - took a water sample from their local water way and compared it with schools in Denmark, Japan, and Russia. 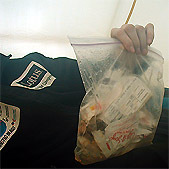 Then, the schools asked the expedition team to take a sample of water from the Arctic Ocean and send it back to be tested for pollutants. Guess which water way had the higest level of pollutants? The Arctic Ocean! Imagine that... (If any of you would like to start a similar test sign into the Trash Talk collaboration zone and find schools to collaborate with). The pollutants found in the test are called organochlorides. There are some 11,000 different organochlorides identified, but the ones most common are CFC's, PCB's, and pesticides such as DDT. Other pollutants are heavy metals like lead, calcium, mercury, and radionucleotides (the result of dumping radioactive waste in the Arctic ocean). These probably all sound very technical, but are actually fairly common in our everyday life. For example, CFC's (chlorofluourocarbons) leak from our refrigeration facilities. CFC’s are a major factor contributing to the depletion of the ozone layer. This is about how much garbage we produce a day. We pack it on the sled and carry it to the "closest" community landfill. How about your garbage? How much do you throw away a day? Where does it go? The effects can be seen in Arctic animals - especially the sea mammals, including seals and report from polar bears - and in the human residents!!! The simple fact is that many toxins are not digested in animals. Rather, they accumulate in fatty tissue; therefore, when a polar bear eats a seal, all the toxins stored in the fat of the seal are now in the polar bear. Each time a polar bear eats a seal, the toxic chemicals in the seal accumulate in the polar bear. This is called bioaccumulation. Each member of the food chain retains the pollutants from the animal it just ate. The levels of contanimation in polar bears have become so high that some tests have categorized them as "toxic waste!" The top of the food chain is the Inuit, whose diet traditionally is very high in fat and consists of the blubber of marine mammals. One study found that almost 20% of Inuit women have PCB levels in their body exceeding the amount we normally consider tolerable! Scientists are linking these contaminants to abnormalities in the human immune system, development of cancer, impaired childhood development, damaged nervous system, and liver and kidney failure. Transboundary pollution is considered one of the greatest threats to the life of arctic sea mammals. 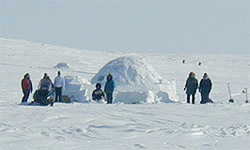 Threats to sea animals also means threats to the Inuit as well. While we were in Baker Lake, we very much enjoyed to be able to hear and read the news. One of the not so great news flashes for us personally, was that president George W. Bush has abandoned his campaign pledge to reduce carbon dioxide pollution and is proposing to make step cuts in federal funding for research in energy efficiency and the development of solar, wind, and other renewable sources of energy reasoning that America is facing a major energy supply crisis. (You might remember we touched on the issue of Congress considering opening up the Alaska Arctic Natural Wildlife Refuge for oil drilling in our from Arviat .) In effect, The White House is asking the Energy Department to cut as much as half of it's $1.1-billion budget for energy efficient research and the development of alternative energy resources as well as possibly ease half a dozen new efficiency standards already put forward by the earlier administration for air conditioners, refrigerators, and washing machines. Those standards - including more efficient compressors, better insulation and new cooling technology - were to be phased in over the next 4 years. So what is the big fuss about carbon dioxide and arctic pollution to all of us who don't eat seal and polar bear for supper? London's Imperial College recently reported that measurements made by Earth-orbiting satelites had found that from 1970 to 1997 there was decrease in the amount of infrared radiation being lost from earth. This confirms what scientist have been predicting for many years, that as a consequence of an increased production of greenhouse gases, we are heading for a global climate warming. The absorption of radiation by the atmosphere is due to greenhouse gases, namely carbon dioxide and methane, which absorb heat rather than let it pass through into space. Listening to some scientists bleak predictions, it seems pretty overwhelming. But the good news is that lots of scientists and people out there have been working on solving the issue. The solution seems to a major emphasis on developing and using renewable resources; however, first and foremost conservation and responsible use of our current resources is key!! So, what does that all mean? Well, one of America's true success stories is the energy efficency born out of the oil crisis in the mid 1970's. New construction technology makes some windows equally as energy efficient as insulated walls. Appliences use two-third less power than in the past. The cost of power generated by wind and solar cells has lowered and can compete with gas-generated electricity. The technology for new air conditioning would save enough energy to help avoid the construction of 11 new power plants on the West Coast and 120 such plants nationwide by 2010 if almost all the old time air conditioners would be replaced. It has actually been calculated that these energy savings would be enough to light up all American homes for two years (according to Dan Reichewr, former head of the Energy Department). As a matter of fact, energy conservation has been so succesfull that it nearly matches oil as the No. 2 energy "source.” So what does all of this mean to you and all of us? Well, one thought we have out here is that there has to be another side to the coin. Like what does this all mean to the people in Texas? We know we have quite a few schools online with us down there as we have heard "your voices" in the chats, and we think it would be really interesting to get your input along with all the rest of you in the "World of Resources" collaboration zone. Now what else can you do to actually make a change? Here are a couple of ideas. First of all, always keep in mind that what goes down your drain may end up in Rudolf's water bowl (the Arctic Ocean). What you and your family does at home, your school, and your town - big or small - does matter in the big picture. Even little things, like dumping hazardous household wastes such as paint thinner down the drain, using less (or none) chemical fertilizers for the green lawns, buy household cleaning products that are bio-degradeble. Take control of your transportation! Walk, bike, take public transportation, or carpool whenever possible. Leaving a car in the drive way during a day's errands can spare the air up to 20 pounds of carbon dioxide!! Remember the Arctic B.R.R.R: Be sure to Reduce, Reuse and Recycle Recycle. * Help reduce the use of nonrenewable resources - an example is to remember to turn of the light! It's a fact that an American-born child will consume 30-40 times the natural resources than a child does in the developing world! *Reuse bags and bottles. Buy rechargeble batteries. The mercury contained in disposable batteries ends up in the soil and may eventually end up in the groundwater! Recycleall you papers, glass and plastics to help cut down on garbage. US alone turns out more than 432,000 tons a day! Finally, write your state senator and let him or her know what is important to YOU. Remember your voice matters! With that in mind, enter your opinion in the "Trash Talk" collaboration zone.